We have been having a good run of Mahi on Fins and Feathers this fall. While Florida Keys Fishing in the fall can be good for Sailfish as they begin there migration to Florida Keys waters, we also see a surge in the Mahi Mahi fishing off the Florida Keys Fishing waters. The past two charters have seen nice catches of Mahi with fish averaging 10 lbs. with some reaching the 30lb. range. With consistent east winds prevailing off the Florida Keys Fishing waters thye Mahi will migrate south surfing down the waves. Frigate Birds also known as Man-o-war birds follow the mahi and with a good pair of binoculars they can be spotted up to two miles away. Florida Keys Fishing for the mahi can be successful by trolling by the working birds with live bait ready to cast when we spot the mahi swimming just below the surface from our tower on the boat. This is a fun and exciting technique for Florida Keys Fishing anglers. Our Key Largo Charterboat had a fun day last Saturday with Jason Tucker from Kansas City. We began wreck fishing off of some Key Largo wrecks and that wasnt providing much action so we decided to try some Florida Keys Fishing for Mahi. We quickly found some weedlines offshore in 500ft. Instantly we hooked a 10 pounder. Caught that fish then hooked another 10 pounder. It seemed like we made the right choice going offshore Key Largo for the Mahi. We then spotted a Man-o-war bird circling about a mile away. When we had gotten close to the bird I noticed a turtle swimming on the surface. In front of the turtle were also 5 big mahi. we managed to catch three of them making the half day a success. Florida Keys Sailfishing should start to heat up soon as the cold fronts push there way through the Florida Keys Fishing Waters. There has been large amounts of bait on the reef which is an excellent sign that the Sails will be nearby. 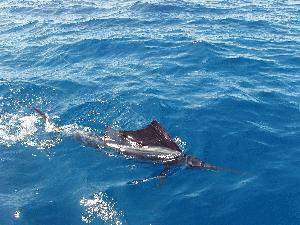 We’ll try and put up Florida Keys Fishing report for Sailfish as soon as it heats up. tight lines!